For all those that have written in, Yes we have a meeting tonight. Don is down in Atlanta, but we will carry on with out him. Today’s topic will be cool,fun and new applications for the Windows Mobile platform. The format will be several demonstrations of several applications that take advantage of the hardware found in current Windows Mobile devices –accelerometers, cameras, GPS, data radios, WiFi and Bluetooth. 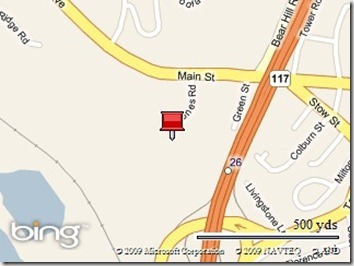 The next meeting of the Boston/New England Windows Mobile User and Developer Group will be held on Wednesday, September 16th starting at 6:30 PM at the Microsoft offices in Waltham, MA (201 Jones Road, 6th Floor). Well it is better late than never. The Windows Mobile group has been working hard on releasing the latest version of Windows Mobile 6.5 aka Windows phone 6.5 since it was announced at Mobile World Congress back in Feb. 2009, to keep parity with the crowded Smartphone marketplace. 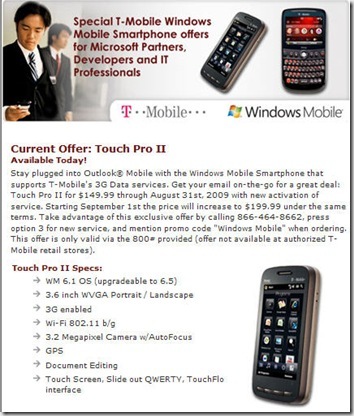 Microsoft also announced that on October 6th, 2009 (which we assume to be at CTIA WIRELESS I.T. & Entertainment)to accompany several new phones and the latest version of the mobile operating system it will be opening up its long awaited App Store called Windows Marketplace for Mobile and popular free My Phone service. In just five weeks, you’ll have a bunch of new Windows phones to choose from. But before we show you some of the cool, new phones that will be coming out, I want to explain how we’re trying to make phones even better with Windows. When we started work on Windows phones, we met with people all over the world who were likely to buy a Smartphone and talked with them about what’s important to them in their phone. Looking at the U.S. market, for example, we found that about 15 million people in the next year will buy a new smartphone. On Oct. 6th, you’ll see new Windows phones designed for a variety of tastes, needs and price points - with or without keyboards, with or without touch screens, as well as your choice of GPS, accelerometer and high resolution camera. There are a lot of great options and we can’t wait to show them to you. Until then, keep an eye on our partners as they announce details on new Windows phones and where you can find them this fall. · In North America: Mobile operators AT&T, Bell Mobility, Sprint, TELUS and Verizon Wireless, and phone manufacturers HP, HTC Corp., LG Electronics, Samsung and Toshiba Corp.
We can only surmise what devices will be receiving the Windows Mobile (Phone) 6.5 update, but with Sprint announcing that their version of the the HTC Touch Pro 2,which looks very similar to the CDMA version of the Touch Pro 2 by T-Mobile will be getting the Windows phone 6.5 OS since it will be available 2 days after the October 6th announcement by Microsoft. 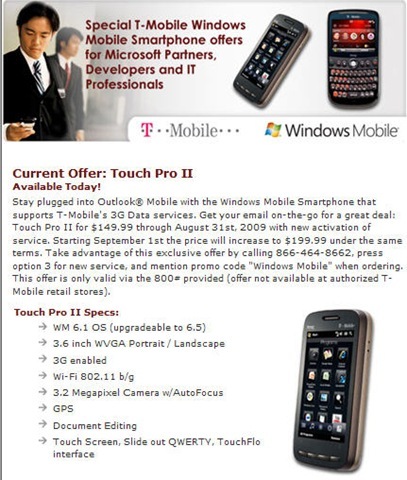 Other versions of the Touch Pro 2 are also expected on other carriers in the same time frame as well from AT&T and Verizon. Many are hoping that existing devices will be getting the Windows Mobile 6.5 update. 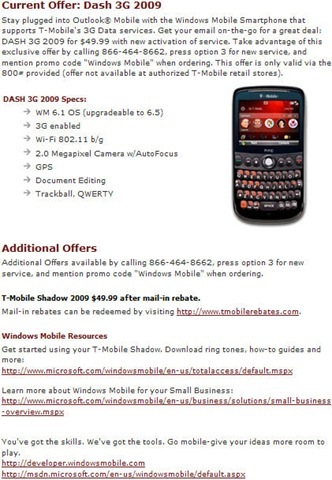 According to the deal posted on wmdeals it states that both the Dash 3G and Touch Pro 2 from T-Mobile will be getting the Windows phone 6.5 update. Hopefully to appease current customers as well as attract new customers to T-Mobile's lower 3G data rates it will be made available for download on or about the 6th. No official word yet so lets keep our fingers crossed on that one. Other rumors are that some other devices will be getting the Windows phone 6.5 update. We already know that the Samsung Jack will be getting the Windows phone 6.5 as announced in May on AT&T, hopefully there will be more announcements in October. Many are already guessing what phones will be coming to which carrier many are hoping for a new version of the popular OLED equipped Samsung Omnia HD,SnapDragon equipped Toshiba’s TG01, or LG’s new phones which have committed to make 50 different Windows Phone devices by 2012. The first handset probably to take advantage of the deal will be the LG GM730 touch-screen Smartphone. LG will be layering its S-Class user interface on top of the operating system, which is a cube-based layout that provides customizable one-touch access to music, Internet services, videos, and other features. 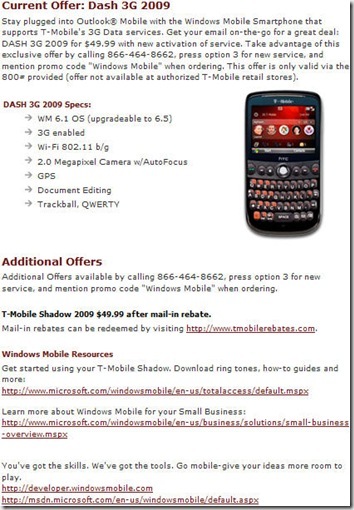 I am really curious what HP will bring to the table, will it be the same devices that had limited exposure in Europe with the Ipaq Data Messenger and Ipaq Voice Messenger or an entirely new phone. I can’t wait to see!